Daily Post: Absolute Beauty… re-blogged. I had blogged this before, totally relying on my memory of this photograph…but now having found it, I wish to share it with my readers. “Beauty is in the eye of the beholder” … I agree. I knew a well-known photographer, Tara Colburn, who found beauty in the images of poor Indian women in the villages of Bihar. What would have appeared to other eyes as poverty and the mundane was captured, through a special magic of her individual perspective, as beauty and soulful by her camera. She has since passed on but I have the honor of possessing three cards that she had gifted me. My favorite is the one of an older woman, her body brown, lean and taut. 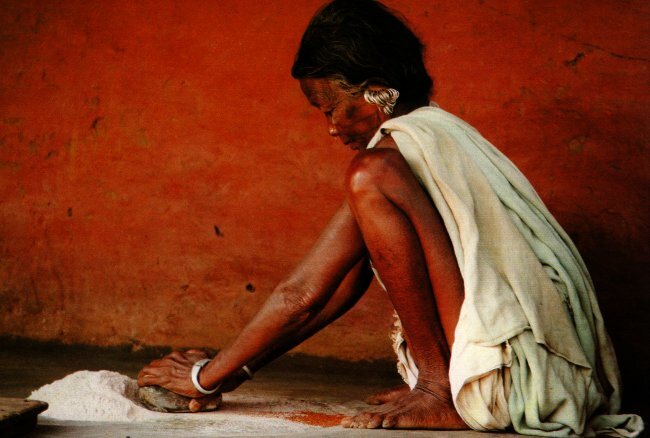 She is sitting on the floor of her hut, grinding spices on a stone. Her back is straight as an arrow, her haunches perfectly folded and her feet squared on the ground. Her wrinkled face is happy and focused on the grinding stone and the perfect grinding of the spices for the food she must now prepare for her family. Nothing else matters … the spare surroundings, the lack of furnishings … just this beautiful woman, her grinding stone and her spices. With a limited color palette of orange, burnt sienna, white and black, the interior of the hut provides a complementary background to the brown body of the woman. While some might see only the material poverty in this photograph, I only see beauty. I really like this! You drew a great picture of the woman and of the photographer’s interest in her. My youngest daughter is a photographer, and she has taken pictures like that as well. We live in a beautiful world, blinded to much of it by our societal constructs of beauty. Thank you! Thank you very much! I appreciate your comment. Yes, isn’t it true? … and the journey itself to seek this out was even more rewarding to my friend because not only did she get a stunning photograph but she also had a revealing moment. Good luck to your daughter … keep taking those pictures! “Beauty is in the eye of the beholder” … I agree. I too agree with your above post and remark, that’s why I found this wonderful blog, sorry, beautiful blog, where each post is not only brilliant but beautiful.